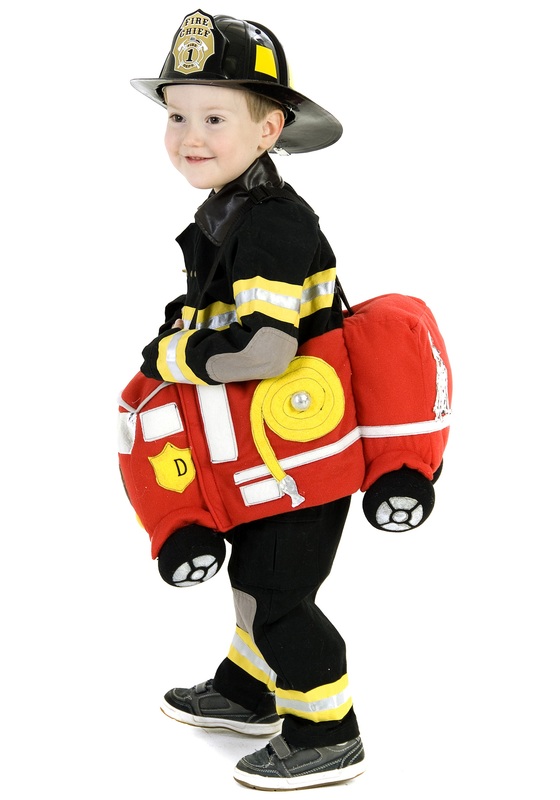 Length-adjustable webbing shoulder straps--max length 30"
It feels like heroic firefighters have been inspiring great Halloween costumes forever. What kid can't find something to admire in their selfless courage, nifty gear, or flashy mode of transportation? But for a long time, any child who wanted to don a flame-resistant slicker and wield a fire extinguisher had to hoof it. And technically, they'll still do most of the legwork as they crisscross the neighborhood in this Ride In A Fire Truck Costume. But this fire helmet and brightly-colored plush firetruck will make getting around a big part of the fun! Your firefighter-in-training will love racing from house to house in search of the next opportunity to lend a helping hand (or collect a few pieces of candy!). Just tell them to take it easy on the gas pedal, okay? It can be hard to tell the difference between the telltale signs of a fresh blaze and the smoke from all that burning rubber! The hat and truck each come with straps to make sure that the costume stays secure even at high speed, and during the breaks in the action we think you'll appreciate the patches, hubcaps, and other great details that liven up the engine's sides. We're guessing that after a busy night of motoring around town, some very sound sleep is bound to follow. But in the morning, we fully expect that your child will want to put on this hat and truck combo for many more hours of imaginative play. And we can't think of any good reason that you should stop them!